Roadtrip chronicles, no. 4: Rowan County deeds. | Scuffalong: Genealogy. Roadtrip chronicles, no. 4: Rowan County deeds. – Scuffalong: Genealogy. Roadtrip chronicles, no. 4: Rowan County deeds. No deeds filed by my Henry W. McNeely. Julius McNeely bought his one and only parcel of land — the one his half-brother Henry’s children inherited — for $20 on 5 January 1876 from J.M. and H.E. Goodman. In 1869, John W. McNeely applied for a homestead exemption. The application, filed at Deed Book 44, page 247, attached descriptions of his real and personal property. His real property consisted one tract of land bordered by Joshua Miller on the north, Frederick Menius on the east, “Dr. Luckey” and Ephraim Overcash on the south, and Jacob Shuliberinger and Mrs. Malissa Pool on the west, containing 235 acres and valued at $940. On 7 January 1880, Ransom Miller, husband of Mary Ann McConnaughey, paid $900 to John S. Henderson, trustee for the estate of Archibald Henderson and Jane C. Boyden, for 135 acres. The land’s bounds lay on the north side of Sills Creek and touched on the Buffalo Big Road, crossed Second Creek and followed its meander to the intersection of Back Creek. On 1 December 1883, Ransom paid G.W. and C.C. Corriher $600 for 40 1/2 acres west of Neely’s Mill Road. On 18 September 1889, Green E. Miller, husband of Grace Adeline Miller, paid $220 to John S. Henderson, trustee for the estate of Archibald Henderson and Jane C. Boyden, for about 22 acres. [Archibald Henderson Jr. and Jane C. Henderson Boyden were children of Salisbury lawyer Archibald Henderson. John Steele Henderson was Archibald Jr.’s son.] The plot description: “beginning at a stone in a field, South of where the said Green Miller now lives” running at one corner to a stake or stone in Ransom Miller’s line. The land was part of the Foster tract on the east side of Sill’s Creek and the west side of the Neely’s Mill Road, but not immediately adjoining either. Green had contracted to buy the property on 30 November 1886. This section of the Cleveland, North Carolina, USGS quadrangle topographical map helps narrow the location of Ransom, Green and Adeline Miller’s properties in Steele township, Rowan County. 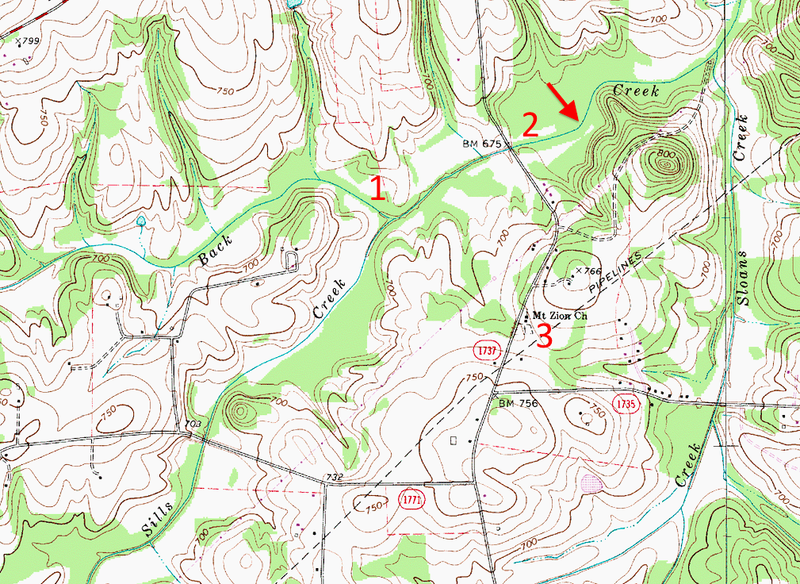 (1) is the point at which (2) Second Creek branches into Back Creek and Sills Creek. That Ransom and Green’s lands adjoined supports a conclusion that Ransom was, in fact, the man referred to in the letter published in local newspapers about a damaging hailstorm in the area. The road running north-south is today called White Road. (3) marks the location of Mount Zion Missionary Baptist Church, attended to this day by descendants of Adeline’s daughter Mary Caroline Miller Brown, her brother John B. McConnaughey and cousins of Martha Miller McNeely‘s husband Henry W. McNeely. → Roadtrip chronicles, no. 5: Daltonia. ← 52 Ancestors in 52 Weeks: 7. Love. Pingback: Roadtrip chronicles, no. 6: Western Rowan County churches. | Scuffalong: Genealogy.